Google (GOOG) has setup the Trader Vic 1-2-3 pattern or a Dow Theory confirmation of a trend change. 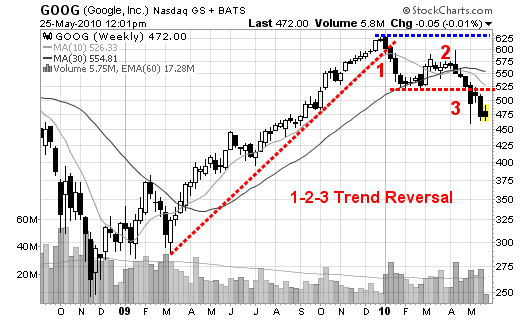 GOOG broke the up-trend after establishing a new 52-week high above $629 (point #1). From there, it consolidated and formed what is referred to as the minor sell-off (the lower horizontal red dotted line). Prices started to rise but failed to make another new high. This test of the previous high failed near point number 2 (March & April). A failure to make a new high is usually (not always) a signal that the trend is about to change. This is where some traders jump in early. Lastly, we reach point number 3 where prices drop below the previous short term minor sell-off (this is trend reversal and the signal to short). If missed, you can short on the first failure to recover the major moving averages (or #3 area which then turns to resistance). This is the pattern I am watching setup in dozens of stocks across multiple industries. I am also watching this pattern to potentially setup in the major indices as well. Remember, have patience and be prepared to sit on the sidelines for a while as this pattern takes time to build and then confirm (4 months for GOOG). The key word is CONFIRMATION! You may play GOOG up and down short term but long term, the trend has changed! Follow me on twitter to watch the stocks currently setting up this pattern (prior to confirmation). 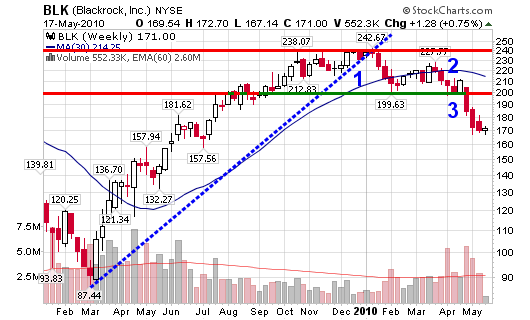 Blackrock (BLK) setup what Trader Vic would term as a 1-2-3 setup or a Dow Theory confirmation of a trend change. BLK broke the up-trend after establishing a new 52-week high above $242. From there, it consolidated and formed what is referred to as the minor sell-off. Prices stared to rise but failed to make another new high. This test of the previous high failed near point number 2. A failure to make a new high is usually (not always) a signal that the trend is about to change. Finally, we reach point number 3 where prices went below the previous short term minor sell-off (this is trend reversal and the signal to short). If missed, you can short on the first failure to recover the major moving averages (or #3 area). In addition to the 1-2-3 setup, the stock has also allowed its 10-week moving average to cross below the 30-week moving average with typically signals a change in trend when both lines are starting to point down. This is essentially the pattern I am watching for in several of the stocks starting to churn (run out of steam) that I posted to my twitter stream. However, have patience and be prepared to sit on the sidelines for a while as this pattern takes time to build and then confirm (nearly four months for BLK). 7:33 PM Apr 6th via web: $BLK – 198.55, clearly falling apart (but gap down has to fill before ultimate slide). 10:02 PM May 5th via web: $BLK…Trading @ 174.80 & going down! This is a game of odds with developed expectancies so take the trades and follow the rules. To short means that you borrow stock from your broker to sell to a third party. The idea is to buy back the stock at a lower price, returning the shares to your broker while leaving the remaining cash in your account as a profit. A short seller does not own the stock before they sell it as they borrow it from another investor who already owns it. At a later date, the short seller buys back the stock they shorted and returns the stock to close out the loan. If the stock has fallen in price since they sold short, they can buy the stock back for less than they received for selling it. The difference is your profit. Please note that short selling is a transaction made on margin. Most ideal longer term trend shorts take four to twelve months after the peak price to setup on the weekly chart with the majority of these shorts triggering between six to nine months. 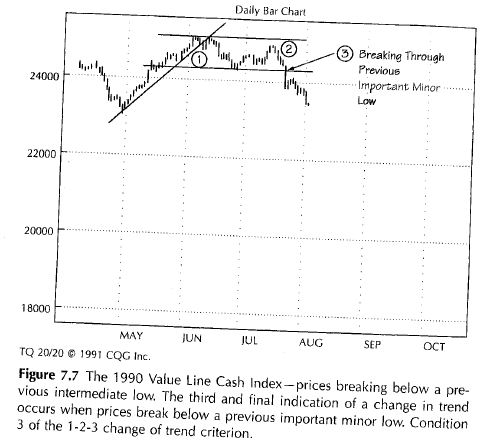 As a short seller, you believe that the price of a particular stock will fall in value over time. For example: by establishing a short position for 100 shares in XYZ at $50, the broker will place $5,000 into your margin account. If the stock falls over the next few weeks and you decide to cover the short at $40, you will initiate a buy for 100 shares in XYZ using the money placed in your account when you sold short. The cost to buy back the shares in this example will be $4,000 or $1,000 less than the original short sale amount. This difference in price will result in $1000 cash that will now become your profit. Today’s screen locates stocks that may become longer term short candidates based on the direction and action of their major moving averages. They are all trading below their 200-day moving averages after reaching a new high within the past 6 months or so. 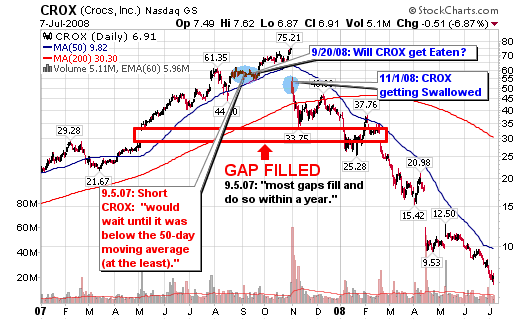 This type of action has historically tipped off a longer term downtrend that may be in the stock’s future. As some of you know, I prefer to use options to capitalize on downtrends rather than shorting the stock outright. See my posts below to understand exactly what I am looking for when placing a short trade or buying put options several months out. 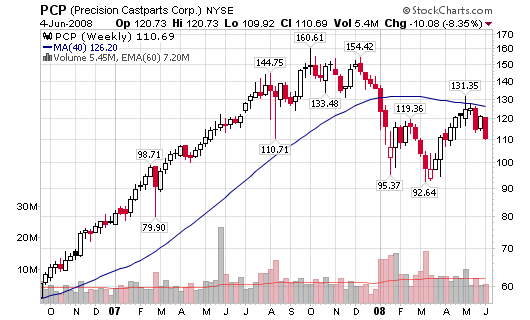 PCP – 110.69, Precision Castparts Corp. is trending lower as the stock is challenging (to move above) the 200-d m.a. for the first time since crossing below the average in January. The stock does sport a 10-week m.a. below the 30-week m.a. GME – 47.38, Gamestop Corp was screened back in March as a stock setting up a possible short but it had one last push before starting to crumble again. Now is the more ideal entry area for a short or put options based on the 200-d m.a. and the 10/30-week crossover. VOD – 30.10, Vodafone Airtouch is attempting to challenge (move above) the 200-d moving average but doesn’t seem to be having success. The 10-week m.a. is trading below the 30-week m.a. 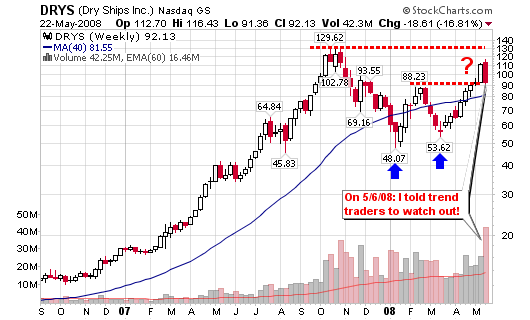 GR – 57.96, Goodrich Corp. is down more than 10% this week on large volume as the 10-week m.a. also trades below the 30-week m.a. A drop below $56 would violate all recent support. LLL – 101.90, L-3 Communications is down more than 5% this week on above average volume as it violates the 200-d m.a. (for the second time since 2006). The 10-week m.a. 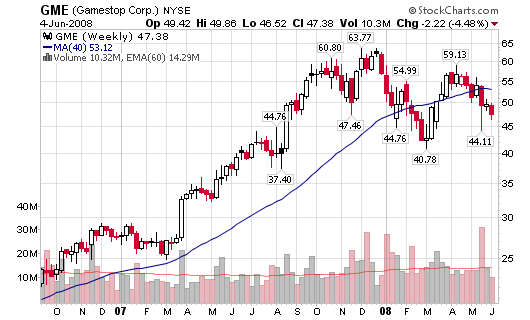 is still above the 30-week moving average so I would not short the stock until they cross. GOLD – 41.14, Randgold Resources, has started to pullback and violate the 200-d m.a. for the first time since the summer of 2007. It may be early to short for the long term but keep an eye on this stock and the commodity in general. The 10-week m.a. is still above the 30-week m.a. (10-week moving average is now trending downward). TEF – 83.21, Telefonica is about six months removed from its high as it trades beneath its 200-d m.a. for the first time in years. The 10-week m.a. is now trading below the 30-week. Please note that it is still early for a few of the names above (they may have some life left for a bounce higher before a longer term decline). Well, DRYS is now down 16.81% this week and volume is peaking at the largest level we have seen in years – huge distribution! This is what I had to say a few weeks ago in my post titled DryShips (DRYS) Drying up? All in all – I am not a buyer of the stock at this level. It may be a solid short term buy for traders that make these types of plays such as Blain and Rajin but it does not fit into my criteria for a trend trading opportunity. I see a decent consolidation over the past few months but I have a problem with the current pattern that is forming if it does not test former highs near $130. Volume is increasing as it moves higher but the stock is starting to struggle near the last peak of $88. I stick to my original analysis as I am watching the stock from afar or the weekly chart. I am not day trading DRYS or any stocks for that matter so I can cut through the noise and view the market on a weekly basis to assess the “true overall trend”. Don’t get me wrong, many traders made money on the recent spike in DRYS but I wasn’t touching it with a 10-foot pole. I look for the big runs and couldn’t be bothered with a few points here and there (and I am not about to support my broker with constant buy and sell commissions, even if they are minimal). The easiest way to characterize this trade and the market in general is to view it all as a risk/ reward potential or an expected value, as I wrote yesterday. DRYS was not a +EV trade in my trading system but, it very well may have been an excellent +EV trade for a shorter term day trader such as Rajin or Blain. The Big Decline (long term perspective of course).